Today I was enjoying my free ticket to the Phillies game. Threshers season ticket holders are given a chance to see the Phillies one game a year. Part of a section is reserved and tickets are dispensed on a first come, first served basis. It’s a great time as you get to see a lot of your friends you haven’t seen since September. Ross and I arrived early and walked around. I saw that there was someone garnering a lot of attention. It wasn’t a player. Phillies owner John Middleton was signing autographs. By this time, we were eating lunch and I had just sat down, so it was either abandon lunch for an autograph or let it go. Lunch won. I was sad about not getting the autograph but I really didn’t have a choice. After lunch, I was feeling good as I’m recovering from my foot surgery so we walked a lap around the field. When we came back around Mr. Middleton was almost to the concourse and still signing. I grabbed my “limited edition, only available for 24 hours” Topps Now card of Bryce Harper’s debut for the Phillies and asked Mr. Middleton to sign it. He did and said he hadn’t seen one nor did he have one and that he thought it was cool. After he walked away, I realized I had a second copy in my bag. So I ran back and caught up to him and gave him the copy. He grabbed my shoulder, smiled and said, “thank you so much that is unbelievably kind and thoughtful of you!” He shook my hand a couple times before thanking me again and heading to the owners suite. I think so many people ask him for things that he really appreciated that someone would think to make such a gesture. I was glad to do something for the man who brought us Bryce Harper…. Today the Phillies picked up 1B Justin Bour for cash and minor league LHP McKenzie Mills. Mills has had a mediocre year, he has an ERA of 3.51, but is only 2-5 on the season. He’s also given up 7 home runs in 89 innings. May be a change of scenery will be just what he needs. Tonight is one of my favorite night of the year, the season ticket holder meet the team party. We get a picnic with the players and then they are formally introduced. Without further ado, I give you your 2018 Clearwater Threshers HERE. Sorry for the absence over the last 10 days or so. I had to have a procedure done on my “Frankenfoot” that required rest. On the plus side, I’m able to walk now, the best since I sprained it and broke a bone just 10 days before spring training began. Yesterday was one of my favorite days of the year…the day that minor league pitchers and catchers report. Additionally, the majority of the position players are here already. I’ve known some of these guys for more than five years so it’s great to see some of my friends again. Matt Hockenberry, who pitched for the Threshers last season, is now a pitching coach for one of the two Gulf Coast League teams the Phillies will be fielding this year. I love this picture as the pitchers are all former colleagues of Hockenberry’s and it’s good to see them all enjoying a laugh together before the work begins. Also in the picture from left to right: Tyler Viza, Alberto Tirado, Alexis Rivero, Garrett Clevenger, Luke Leftwich and Jacob Waguespack in the red shirt. You Just Don’t See This Everyday, Bo Bichette, Cavan Biggio and Vladimir Guerrero, Jr. Baseball Ross likes to say that he loves baseball because every game you watch, you see something you’ve never seen before. Today, that was seeing the sons of 3 major league stars bat, 1-2-3 in Dunedin’s line up. Today was the final regular season game for the Threshers and Blue Jays. The Jays eliminated the Threshers on Thursday night so the last three games have been less than thrilling, shall we say. There was a reason, however, that I chose to go out in the 90* heat this afternoon to watch a game that was essentially meaningless. It was the fact that the sons of three major league players batting 1-2-3 in the order. First up was Bo Bichette, son of Dante Bichette who played for the Angels, Brewers, Rockies, Reds and Red Sox. He was a 4 time all-star who finished 2nd in MVP voting in 1995. Dante Bichette, Jr., Bo’s older brother plays for the Trenton Thunder, the Yankees AA farm team. Bo split the season between the Lansing Lugnuts and Dunedin Jays. He had 14 home runs, 74 RBIs, 42 walks and a batting average of .362. Second up was Cavan Biggio, son of Craig Biggio who played his entire career with the Houston Astros. He was a 7-time National League All Star and is often regarded as the best player in Astros history. Cavan, played the entire season in Dunedin and had 11 home runs, 60 RBIs and 74 walks with a .233 batting average. Third in the order today was Vladimir Guerrero, Jr. He is the son of Vladimir Guerrero who played for the Expos, Angels, Rangers and Orioles. He was voted the American League MVP in 2004. Jr, had a rather impressive season starting with the Lansing Lugnuts before moving up to Dunedin. In total, he had 13 home runs, 76 RBIs and 76 walks with a batting average of .323. The thing that struck me the most about him is that he doesn’t “act” like a star. I’ve seen him retrieve balls and hand them to the batboy (most guys just ignore them) and I’ve seen him spent a lot of time signing autographs after a game, with a smile on his face. It’s made for an interesting second half of the season. I’ve enjoyed watching them and plan on going down to the stadium on Tuesday to see the first game of the first round of the playoffs. It may just be the first time that three sons of three major leagues play together on a team that wins a playoff game. I’m sure Stats.inc. has someone one who knows for sure, but even if it has, it’s nothing we’ve ever seen before and that’s why we love baseball. I got caught up in Tebow mania. It was a crazy carnival atmosphere and Tebow did not disappoint. He hit a 2-run RBI single that electrified the crowd. I put together a video that has pictures as well as video from his first at bat and the 2-run single. You can watch that video HERE. When was the last time you saw the home team PROMOTING a player FROM THE OPPOSING team? 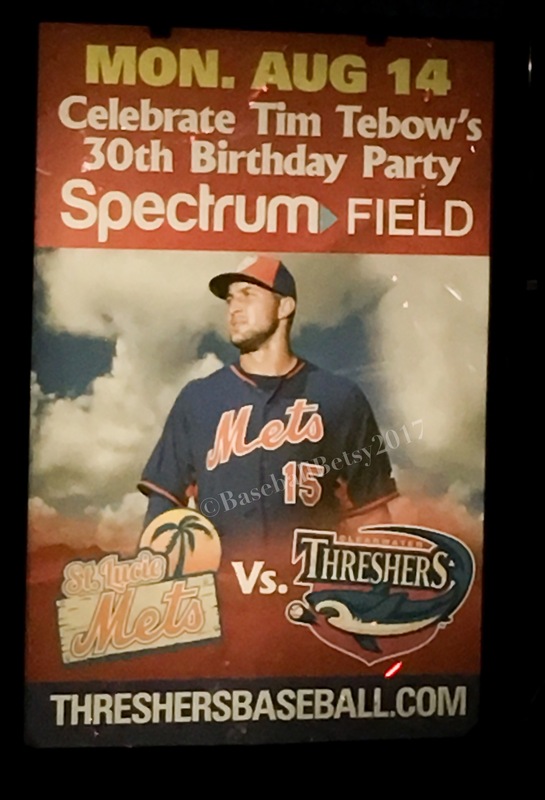 Apparently, Tebow-Mania has created such a frenzy, that the Threshers are promoting an opposing player. Not only that, they are THROWING HIM A 30th BIRTHDAY PARTY! Ok, I have nothing against Tebow. I admire the guy for staying true to himself, his convictions and for chasing his dream. I hope to get his autograph for just those reasons alone. What I don’t get is why my team is using an opposing player for promotion. Granted, there’s been studies of the “Tebow-effect” on Minor League ball. Wherever he plays, attendance soars. Tampa usually draws around 700-800 a game, Saturday night they had 7,157–almost TEN TIMES normal. May be if the teams advertised like this for all the games, attendance would be higher too. The Threshers have been advertising this on local cable quite a bit, where the rest of the summer I’ve only seen a handful of commercials. Spectrum Field is speculating that we will have “Spring Training-Like” crowds with at least one night being close to being sold out, if not sold out. Spectrum Field seats around 7,600 and can hold around 10,000 with berm and standing room added. So we shall see what happens. Stay tuned to my Twitter @BaseballBetsy for updates as they happen tonight as well as pictures and photos of the spectacle.